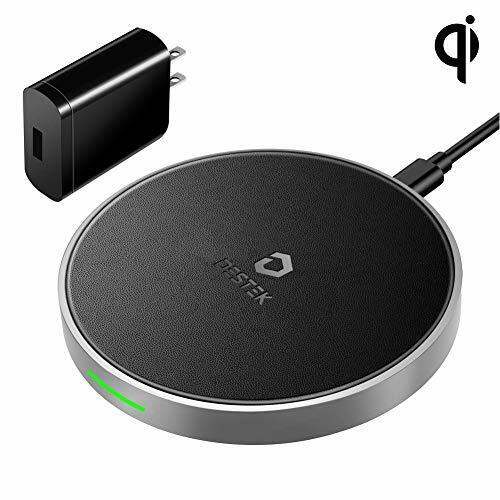 DESTEK wireless charging pad will meet the wireless fast charging needs of multiple mobile phones for you and your family. Q:How long does it take my phone to be fully charged? Note: The environmental temperature will affect the charging time. When the environmental temperature is higher, the charging time will be longer. The best environmental temperature is 64.4 -78.5 ℉. or an obstruction is detected, LED flashes. 2.Any metal and or magnetic parts, and cases thicker than 3mm will make it can not be the charge. Please take them off. 3. It is a normal phenomenon that the device get warm when it is charging. 4. Wireless charger is NOT compatible with Apple Watch. We guarantee a satisfactory solution within 48 hours, that is why we offer a 24 month warranty and provide friendly, easy-to-obtain support. √ Equipped with AC Adapter: Perhaps you don't know that the charging speed will be affected by the adapter output. Obviously, this is a physical problem. Don't worry, the high-output adapter can adaptively provide the highest charging power.★★NOTE:★★our adapter is completely matched with the wireless charger. Considering your phone battery life, please don't use other adapters to charge. √ Widely Compatible with All Qi-Enabled Phones: Each family or individual will have multiple cell phones, different charging ports or data lines, clutter and disorder are not the way we want. A wireless charger pad which has quick charging solutions perfectly compatible with Samsung and Apple will end these annoyances. √ Intelligent Protection: Charging safety is one of our important design concepts, temperature control ensures your phone won't overheat. It also has over-current protection and short-circuit protection function and is Qi, CE, FCC, and Rosh certified.